New Nutrition Rules for Kids' Meals: "Failure to Lunch"
Children who buy lunch in public schools are now being served up healthier options, including more fruits and vegetables, as new U.S. Department of Agriculture's National School Lunch Program standards go into effect this year. But it turns out the kids are taking and tossing the healthy stuff. Children who buy lunch in public schools are now being served up healthier options, including more fruits and vegetables, as new U.S. Department of Agriculture's National School Lunch Program standards go into effect this year. The Lake County Florida school district, in the land of sun-kissed oranges, figured they would get a jump start and implemented the new rules last year. It turns out the kids were taking and tossing. They trashed more than $75,000 worth of produce. One theory is that many of the kids, having never seen a plant-based food that didn’t come out of a bottle or can, don’t realize they are edible. Perhaps a more likely explanation is that what's being served is not as appealing as it could be. And in fact, there's evidence that school lunch programs are struggling to meet the new federal health standards (the Healthy, Hunger-Free Kids Act of 2010 requires schools to meet stricter nutritional standards in 2012-2013 to receive extra federal funds for free lunches). 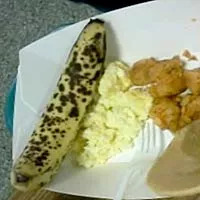 One Detroit teen started a school lunch boycott with a Facebook page stocked with images of the unappetizing dishes being served at his school. And teens in other towns are also organizing boycotts too. One of the proposed solutions for decreasing the waste is to install cameras near the trash cans so school officials can figure out what's most likely to get chucked. Either way, videotaping might not be the best way to reduce food waste and get kids to make better food choices. Instead, it makes sense to provide healthier meals that are also fresh and appealing and provide more education to parents and kids about healthy eating. Over time both children and parents will get used to the idea of healthier school lunches and eventually, they’ll become the norm. On this week’s Talk of the Nation, Chef Ann Cooper said the healthy school lunch program she helped create four years ago in various Boulder, Colo. school districts has finally begun to see the initial opposition fade. Participation in the program is steadily creeping upward. If we stick with the plan and show our support for it--both at school and at home--our children just might get over their nutri-phobia and starting eating better. Nothing will change overnight so we need to be patient. But somewhere down the road, it could make a real difference in the health of the entire nation. New Nutrition Rules for Kids&#039; Meals: "Failure to Lunch"